Those who are not at liberty to spend as frivolously as they may desire usually turn to discount and thrift shops to catch a bargain. The issue that arises from doing so brings the quality and durability of the product into question. While touring the magnificent streets of Busan, why not pay a visit to its markets that maintain the balance between quality and price? Here’s our list of five markets in Busan that you should visit. 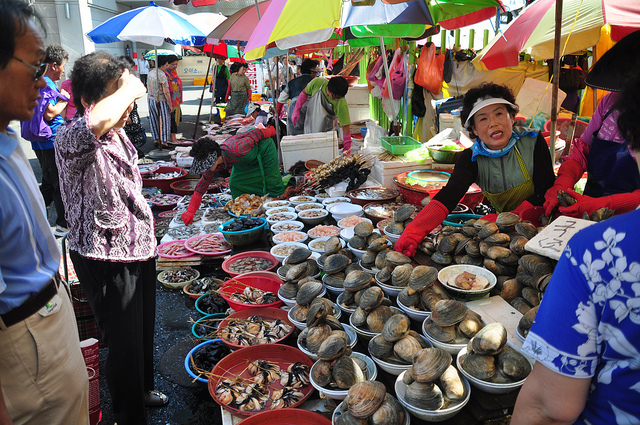 Steeped in decades of history, the Gukje market is the largest traditional market in Busan. Gukje Market was established during the Korean War in 1950, intended to be a place for refugees to set up shop in order to make a living, but soon grew into a thriving, popular market. The market sports a bohemian, vintage theme with the vendors selling both new and old affordable items so customers can avoid the exorbitant prices that come attached to produce sold in retail outlets. 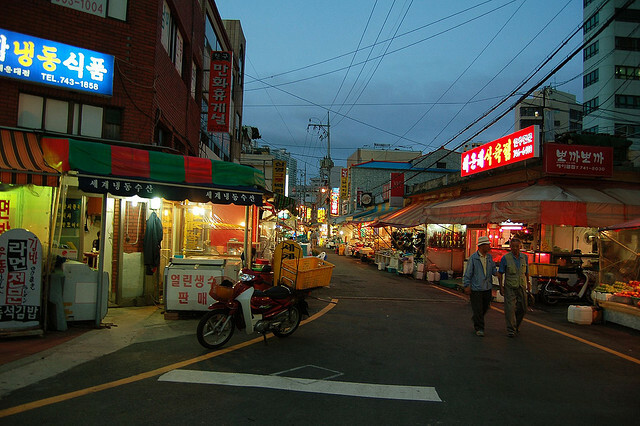 Located near Nampo-dong, a commercial shopping center, this busy market was the very center of commerce, since military supplies along with imported goods were transported through the neighboring port city. Bordering the beach coastline, this market boasts a variety of fish alongside meat, fruit, clothes and miscellaneous items. It’s a revitalizing chance to tour the stalls amid the cool, dry air and blow off some steam at the neighboring Haeundae beach. Should you want to refuel, the many restaurants, selling delectable local fare, are dotted all around the market, enabling guests to dine while they peruse the unique paraphernalia that is being promoted. Though extremely busy and packed with fellow thrifty spenders, the market gives tourists an insight into the more rural side of Busan. A haven for seafood lovers, the Jalgachi market is regarded as being one of the ten landmarks of Busan, hence making it a frequented place by tourists. Those living in rented accommodation in order to live like a local can really benefit from the market since staple dishes are also promoted by vendors who have prepared them with the freshest of ingredients. To savor a meal without a bowl of kimchi to accompany it is almost unheard of in Korean culture. Therefore, the stalls offer a vast array of vegetarian side dishes, merged with pungent spices that emanate an intoxicating aroma. A must-see destination for curious travelers and backpackers. For those who consider shoes to be their kryptonite, the Jayu Market, situated in the Youngnam area, is the ultimate footwear paradise. It showcases a multitude of styles, hues and sizes at an economical price, so those who adore a good bargain can flock to Jayu and shop to their heart’s content. Whether you desire a durable and functional pair of trainers to sweat out your worries, or a polished and pretty pair of pumps to add the finishing touches to your outfit, the Jayu market has you covered. 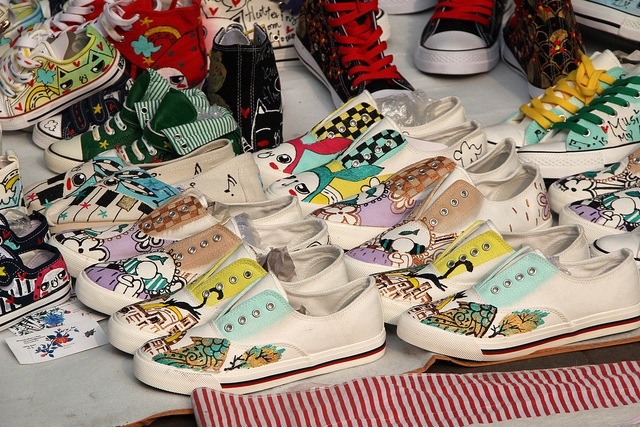 In addition, an avant garde selection of clothes are also available for sale along with a floor dedicated to flowers. Should you require a trademark gift for a special occasion, the impressive assortment of flowering plants will dazzle you. 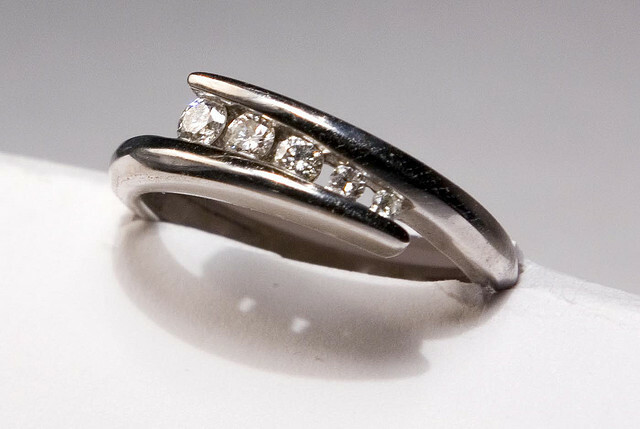 This wholesale Jewelry Market recruits over 700 retailers and 100 factories in order to provide everything from rings and necklaces to clocks and other electronics at an affordable price. Residing near the Citizen’s Hall (a cultural platform on which many theater productions take place) the market is divided into several sections and features a design for everyone for any occasion. Be it a diamond encrusted wedding band or a 22-karat gold charm bracelet for that special someone, the jewelry market ensures your meet your sparkling match.